With bans on everything from bathroom choice to international travel, executive orders issued by the Trump administration have affected numerous facets of daily life in America for some people. 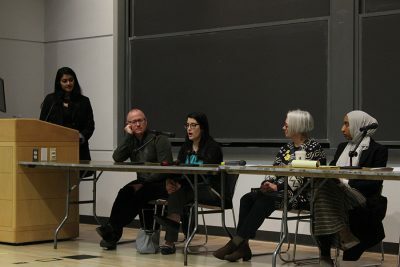 Saturday, Boston University’s chapter of Amnesty International hosted “Human Rights One Year Into the Trump Administration,” in partnership with the Islamic Society of BU, BU’s Organization of Pakistani Students and BU’s International Affairs Association. Nawal Wasif, a sophomore in the College of Arts and Sciences and president of Amnesty International at BU, said the panel was organized to address concerns raised by the Trump administration that may affect immigrants at BU. Monika Nayak, a senior in CAS and treasurer of Amnesty International BU, moderated the discussion by reading questions submitted through Facebook. Terry Rockefeller, a member of Amnesty International USA’s board of directors, said she’s seen an international change in the conversation around human rights. “We’re really witnessing a politics of demonization that goes on, and [it’s] almost permitting people to express intolerant, often racist, often sexist opinions and use of hate speech that can insight violence,” Rockefeller said. Tahirah Dean, an immigration attorney at Tempus Fugit Law, said she doesn’t understand how the government can turn away refugees who seek asylum in the United States. Refugees leave their home countries expecting better treatment in the United States, when that might not be true said Hiam Altali, president and founder of Justice for Detainees in Syria. An increasing number of detainees are being housed in county jails in Massachusetts said Elena Noureddine, an attorney for the Political Asylum/Immigration Representation Project. According to Noureddine, over 90 percent of immigration detainees are held at these jails. These are the same facilities housing people serving short criminal sentences, so there are no benefits or programs normally available to someone serving a state sentence like GED classes or Alcoholics Anonymous groups, Noureddine said. Regarding voter ID laws, Timothy Longman, director for the Institute on Culture, Religion and World Affairs and political science professor at BU, said he’s seen a consistent effort by politicians to suppress the vote for certain populations in America. Yoana Kuzmova, an instructor at BU’s International Human Rights Clinic, said the United States tends to have an isolated scope when it comes to discussing human rights. Only talking about the issue, Kuzmova said, is not enough to effect physical change. Allison Horowitz, a senior pursuing a dual-degree in the School of Education and the Sargent College of Health and Rehabilitation Sciences, said she was familiar with a lot of local issues but wanted to expand her knowledge. CORRECTION: A previous version of this article said Kuzmova was “an immigration law lecturer at BU.” It should say Kuzmova is “an instructor at BU’s International Human Rights Clinic.” The current version reflects this change.